It should be obvious to everyone that Chrysler didn’t just reinvent the minivan – they also manage to perfect it year after year. The 2019 Pacifica is no different, even with very few significant changes, the Pacifica gets better and better. Consumers looking to buy a reliable and durable family vehicle should look no further, the Pacifica is loaded with entertainment, convenience and safety. The Chrysler Pacifica is powered by a 3.6-liter Pentastar® V6 engine with VVT technology capable of generating 287 horsepower and 262 lb-ft of torque. The impressive TorqueFlite 9-speed automatic transmission helps to give the Pacifica a superb fuel economy of 18 mpg in the city and 28 mpg on the highway. Equipped with a re-engineered platform, the 2019 Pacifica works hard to reduce vibrations, harshness, and cabin noise to make for an exceptional ride. There are six trims available -L, LX, Touring Plus, Touring L, Touring L Plus, and Limited trims. All come standard with the 3.6L Pentastar® V6 engine. Additionally, a top of its class towing capability of 3,600 lbs makes this vehicle even more striking. The re-engineered platform on the 2019 Pacifica makes for a lighter and stiffer minivan with improved responsiveness – absorbing and redistributing road blemishes is a breeze. The latest edition of electronic stability control shines in the Pacifica as it course corrects by engaging brake control and engine throttling when necessary. Consumers can expect a smooth ride from a minivan and the Pacifica does not disappoint. The lightweight high-strength steel used by Chrysler also allows for a shapely aerodynamic vehicle without compromising safety. The Pacifica remains the tallest and widest vehicle in its class, easily providing consumers with that roominess they’ve come to expect from a minivan while maintaining a crisp profile. Consumers can enjoy standard features such as all-season tires, deep tinted glass, liftgate rear cargo access,and heated mirrors throughout the Pacifica lineup. Two new available exterior colors, luxury white and maximum steel, are set for late availability and bring up the available exterior colors to a total of ten. A tri-pane panoramic roof, hands-free power liftgate, and power-sliding doors are all features available on the Touring Plus trim going forward. 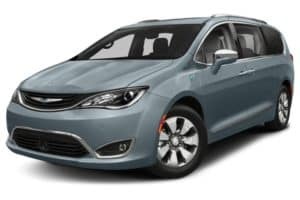 As is expected with minivans, the 2019 Pacifica has 3 rows of seating that allows for up to eight passengers, including the driver. A 12-volt power outlet, active noise cancellation, an electric vehicle info center, and a temperature display are all standard features that make getting around in a minivan easy. The higher-tier Touring L edition has second and third-row window shades standard, while trims from the LX onward have standard in-floor storage bins for convenience. The optional Stow n’ Vac feature, a vacuum that extends throughout the cabin, makes for a cool addition for a quick and easy cleanup. The 2019 Pacifica lineup enjoys a Uconnect 4 system with a 7-inch display as the standard infotainment system. Apple CarPlay and Android Auto capabilities are included, making sure consumers are both connected and focused on the road. Integrated Bluetooth technology is also included. An optional, but insanely rewarding Uconnect Theater offers this minivan some serious entertainment with two 10.1-inch HD touchscreens – enabled with a Blu-ray player, HDMI ports, Bluetooth remotes, downloadable games and apps, and streaming capabilities. Included with the purchase of any Chrysler Pacifica is a complimentary 1-year SiriusXM Satellite Radio subscription. Enrollment in the trial is required prior to enjoying the SiriusXM service. It’s no surprise that a family-oriented car like a minivan was designed with your family’s safety in mind. Standard safety features on the 2019 Pacifica include advanced multistage airbags, driver inflatable knee-bolster airbag, passenger knee-bolster airbag, supplemental front-seat mounted airbags, supplemental side curtain airbags, hill start assist, remote keyless entry, electronic stability control, and Sentry Key theft deterrent system. Some of the more advanced safety features like full speed forward collision warning, LaneSense lane departure warning, parallel and perpendicular park assist are available as an option. All Chrysler vehicles are covered by a 5-year or 60,000-mile powertrain warranty, a 3-year or 36,000-mile basic warranty, roadside assistance for five years or 60,000 miles, and rust-through coverage for five years. The Chrysler Pacifica has a starting MSRP of $26,995 (plus destination fee). Find Your 2019 Chrysler Pacifica At Hollywood Chrysler Jeep!